The son of an army officer, Christopher Lee was born in London, 1922. After serving in the RAF (Royal Air Force) for six years in the early forties, he signed a contract with Rank Studio and made his film debut with a small part in 1947's Corridor of Mirrors. There would be other minor roles within the next ten years. But it wasn't until 1957, when he starred as the Monster in The Curse of Frankenstein for Hammer Films, that he found his true calling. And so began one of the most prolific careers in the genre and a partnership with Hammer that would last nearly two decades. In quick succession, Lee would put his indelible stamp on the Count in 1958's Horror of Dracula (thus becaming the actor most closely associated with the role) and 1959's remake of The Mummy. Also in '59, he portrayed Sir Henry in director Terence Fisher's version of The Hound of the Baskervilles. Among his best works are The Skull (1965), Rasputin: The Mad Monk (1966), Theatre of Death (1967), The Devil Rides Out (1968) and Horror Express, an outlandish horror/sci-fi flick filmed in Spain and released in 1972. 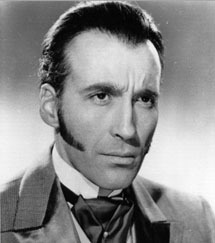 Lee would play Dracula a number of times, most notably in 1966's Dracula: Prince of Darkness and Dracula Has Risen From the Grave (1968). The Satanic Rites of Dracula (1973) would be his last turn in the part. The Wicker Man (also '73) was arguably one of his finest films in the genre. The strange story about the mysterious disappearance of a little girl...and the search for her by an officer on an island ruled by pagan worship, has only grown in stature over the years. It is not to be missed. Christopher Lee's command of the screen and the breadth of experience he brings to his roles continues to be in demand to this day.